The first day of June saw four friends come away from Out of Our Hands with handcrafted pairs of porcupine quill earrings. Above, Melanie and Ann Marie work on gluing and adding the ear wires. 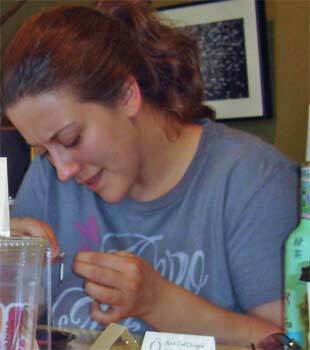 I taught a Porcupine Quill Jewelry Workshop at the Emmaus, PA, store on Sunday, the first of many workshops to come at Out of Our Hands. Each lady created a unique version of my single quill earrings with stone chips. We had a lot of laughs and learned a little about porcupines and porcupine quillwork while chatting about growing up in the area. Two of the women and I graduated from the same high school. We’re amazed that Emmaus has turned from the “boring” town of our youth to a quaint little place the people come to visit! Shannon knots the thread before adding ear wires. Coryn threads the needle for one last pass through the beads. 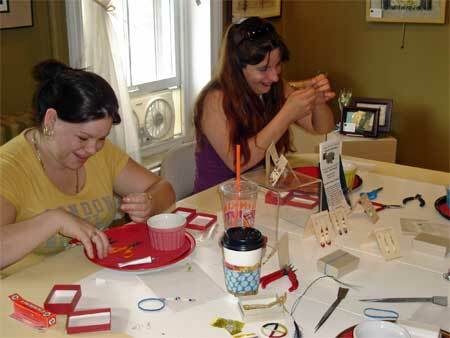 The women had such a blast, they want to take the horse hair earring class. 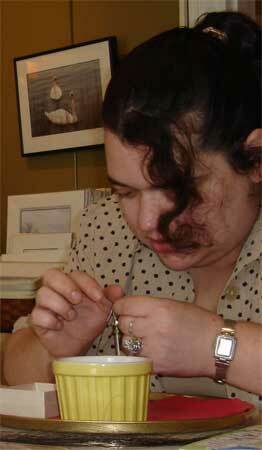 I will be offering a Horse Hair Earring class at Out of Our Hands, as well, hopefully in July. 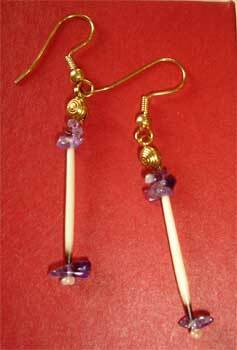 If you’re interested in learning how to make horse hair earrings, contact me or Out of Our Hands to sign up. I’ll post more about the dates and times as the information becomes available. Click on my events page to find out more. This entry was posted in Events, Jewelry, Porcupine Quillwork and tagged beading, classes, horse hair, Jewelry, out of our hands, porcupine quills by Susan. Bookmark the permalink.